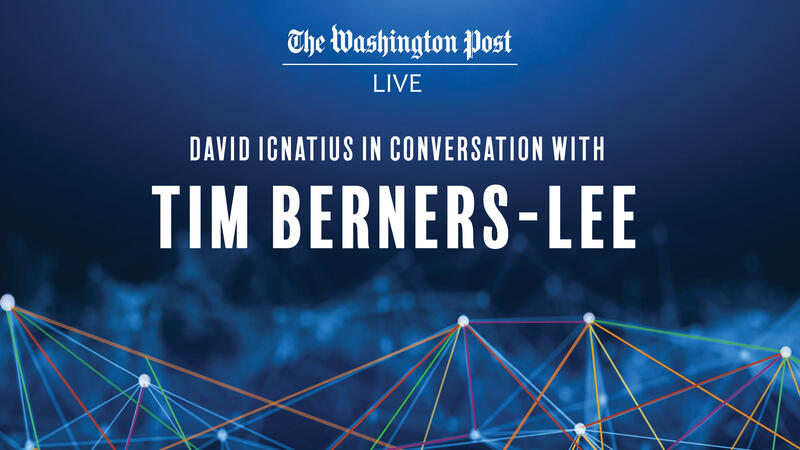 Please join Washington Post Live for an exclusive interview with Tim Berners-Lee, the inventor of the World Wide Web, on Tuesday morning, March 5th. Washington Post columnist David Ignatius will host this wide-ranging conversation one week before the 30th anniversary of the web's invention. Berners-Lee will share his views on the rise of disinformation and censorship, threats to digital privacy, and his efforts through his company Inrupt — and technology Solid — which empowers people to take back ownership of their data. Berners-Lee invented the World Wide Web in 1989 while working at CERN (The European Organization for Nuclear Research). He identified the three core technologies that serve as the foundation of today's web: HTML, URL and HTTP and went on to create the first web page editor, browser and server. Today, more than half the world's population is online, profoundly democratizing access to information and transforming the way we live, work and play. He set up the Web Foundation to advocate for the web as a public good and a basic right. Free to attend. Pre-registration is required. The program will be streamed live for those who cannot attend in person at wapo.st/timbernerslee. To register to receive a live stream notification click here.